For the first time, the IAEM conference last month debuted the Crisis Technology Center (CTC). 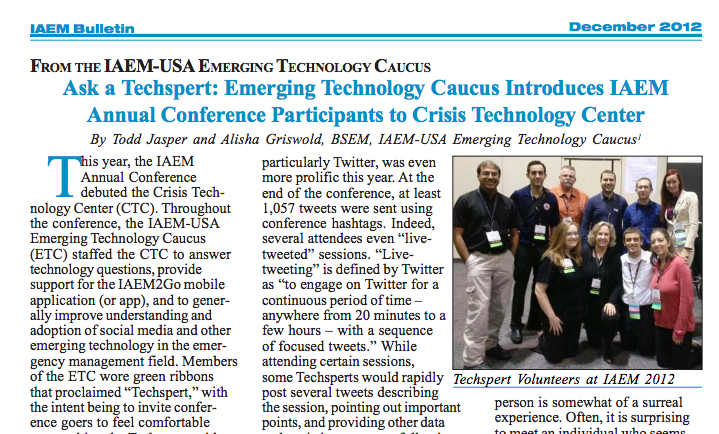 Throughout this year’s IAEM conference in Orlando, the Emerging Technology Caucus (ETC) set-up and staffed the CTC to answer technology questions, provide support for the IAEM2Go mobile application (or app), and to generally improve understanding and adoption of social media and other emerging technology in the emergency management field. Members of the ETC wore green ribbons that proclaimed “Techspert”, with the intent being to invite conference goers to feel comfortable approaching the Techsperts with technology questions. The CTC provided the opportunity for Techsperts to converse with their emergency management colleagues about social media, new technology, and share lessons learned and best practices. Of course, as mentioned in a many sessions during this year’s conference, social media was a very popular topic and tended to be the most popular question posed to the Techsperts. The ETC had a total of fourteen Techspert volunteers comprising of a 50/50 split between Emerging Technology Caucus and Student Caucus members. The Techsperts are experts from various fields and unique disciplines, such as local emergency management, federal public health, and even regional volunteer coordination. The booth provided conference goers with several benefits, such as live tracking of Hurricane Sandy, a visual presentation of the most popular tweets about the conference, and an open forum for technology questions. Social media, particularly Twitter, was even more prolific this year. At the end of the conference, at least 1,057 tweets were sent using conference hashtags. Indeed, a several conference goers even “live-tweeted” sessions. “Live-tweeting” is defined by Twitter as “to engage on Twitter for a continuous period of time—anywhere from 20 minutes to a few hours—with a sequence of focused Tweets.” While attending certain sessions, some Techsperts would rapidly post several tweets describing the session, pointing out important points, and providing other data and statistics to anyone following the session remotely. Aside from introducing the concept of Twitter (since the majority of Techsperts were graduates of the National Disaster Preparedness Training Center social media course), Techsperts could help agencies and individuals establish maintain both their personal profile and Facebook page for their agencies. Emergency managers who lacked familiarity or comfort with social media were given an opportunity to meet with Techsperts who have experience using social media in disasters. Additionally, the Emerging Technology Caucus–having just celebrated its one-year anniversary–used the Crisis Technology Center as an opportunity to build camaraderie and team unity. Since most of the ETC members only know each other through social media, getting a chance to meet in person is somewhat of a surreal experience. Oftentimes it is surprising to meet an individual that seems ordinarily reserved on Twitter, only to discover that the person is actually a social butterfly (or vice versa). Affectionately called the “Nerd Herd”, through service to the IAEM community, the ETC became a stronger team.